Honey Crunch Curves is an excellent cereal choice in terms of both flavor and nutrition. The flakes are slightly thicker and crunchier than traditional corn or wheat flakes. 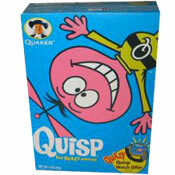 The cereal has a mild sweetness and a flavor that might be described as "toasted brown sugar". While honey is mentioned in the name of the cereal, it's not a very noticeable presence in the taste. Nutritionally, this cereal is terrific. Each 1 cup serving contains 5 grams of dietary fiber, 0 grams saturated fat and 0 grams trans fat. Sugar comes in at 9 grams which is neither great nor horrible. The spattering of vitamins and minerals on the side panel is fairly high compared to most other cereals. The first ingredients listed under the nutritional facts are: whole grain rice, whole grain wheat, sugar, rice, corn bran and inulin. Inulin? Inulin is a plant-derivative sweetener that's also considered a soluble fiber. Baring any unforeseen reports that it kills you, we should start seeing inulin appearing higher in the ingredients of more cereals. It's also known to increase calcium-, and possibly magnesium-, absorption in the blood stream. It should be noted that too much inulin has been known to cause gas or bloating. Fortunately, this reviewer suffered none of those side effects after eating two bowls of this cereal. 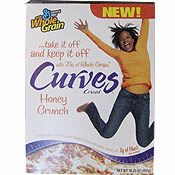 Whether you use this cereal to "...take (weight) off and keep it off" as the box urges or if you just want a nice cereal that taste good, give Honey Crunch Curves a try. You may not jump for joy like the woman on the box cover, but there a better than average chance, you'll enjoy your breakfast. What do you think of Honey Crunch Curves? This cereal tastes healthy, ie: boring. I wont buy it again. I really like this cereal. Was looking for a cereal high in fiber that didn't taste like cardboard and this one fits perfect.